Coastal environmental concerns are highly relevant to land locked Alberta, but rarely do we discuss them. Join the ELC and our guest speakers to look beyond Alberta’s borders at the conundrums of crude and coastal communities. Up for discussion – the ecological, jurisdictional and legal challenges that arise in relation to what has become a significant and divisive issue: the export of Alberta’s oil and gas. 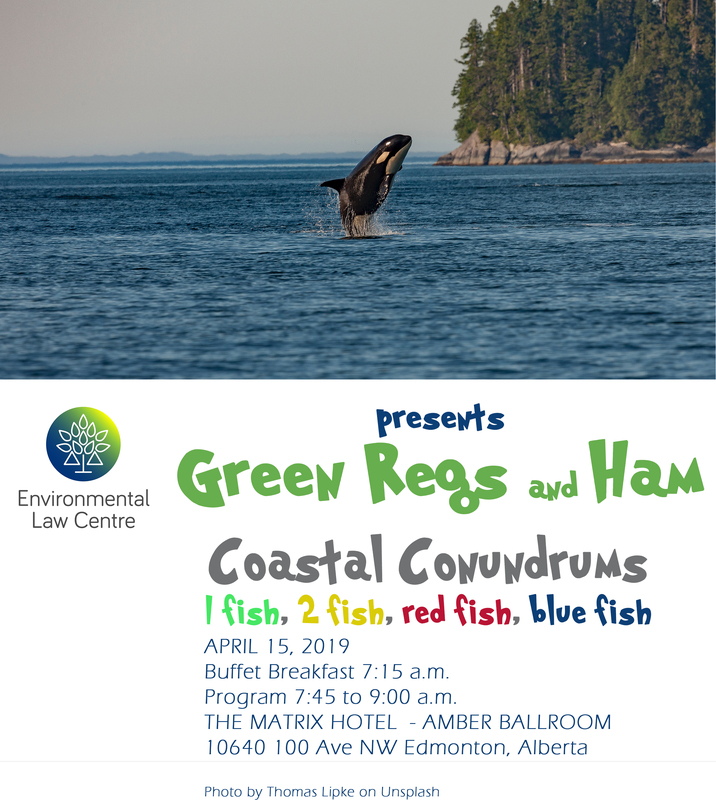 Join the ELC, Dr. Stephanie Green and Professor Cameron Jefferies as we dive into the coastal challenges that need to be resolved while enjoying a hearty Green Regs and Ham buffet breakfast. Dr. Stephanie Green is an Assistant Professor in Biological Sciences at the University of Alberta, where she holds the Alfred P. Sloan Fellowship in Ocean Sciences. Her research focuses on the causes and consequences of biodiversity change in marine and freshwater ecosystems, with the goal of developing science-based tools to inform natural resource management and conservation under global change. Research projects in her group combine a variety of methods—including animal behavioural observation, field and lab experiments, and quantitative modeling—to understand how biological invasion, climate change, habitat modification, and exploitation are altering species interactions and functions within aquatic food webs. Dr. Green completed her PhD at Simon Fraser University, and held a Banting Postdoctoral Fellowship at Stanford University and a David H. Smith Conservation Science Fellowship at Oregon State University before joining the University of Alberta. Professor Cameron Jefferies is an Assistant Professor with the Faculty of Law at the University of Alberta. His work focuses on matters of international and domestic environmental law, energy and natural resources law, oceans law and policy, and tort law. He is the author of Marine Mammal Conservation and the Law of the Sea (Oxford University Press, 2016), a co-author of Tort Law, 6th ed. (Thomson Reuters, 2017), and a co-editor of Global Environmental Change and Innovation in International Law (Cambridge University Press, 2018). He has also authored a number of book chapters and journal articles, including articles in the Energy Law Journal and the Journal of Environmental Law and Practice. He is actively involved in the local environmental rights movement. He previously worked as a research associate at the Health Law Institute and qualified as a lawyer with the Edmonton firm of Field LLP. He earned his doctorate in law at the University of Virginia, where he studied as a Fulbright scholar.